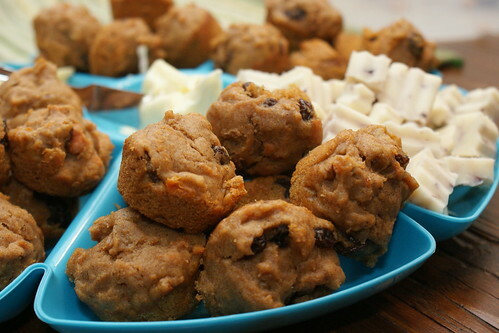 Raisin and Sweet Potato Mini Muffins, originally uploaded by laurasjoquist. If you’re a member of the Bibliognomes Book Club and came to the meeting today, then these mini muffins were all yours. Delicious if I do say so myself. And the coolest part is the no sugar. Sweet potato and honey are the sweetners. In a bowl, combine the flour, cinnamon, nutmeg and cloves. Combine the sweet potatoes, oil, eggs and vanilla; stir into the dry ingredients just until moistened. Fold in raisins. Bake at 350 degrees F for about 12 minutes or until a toothpick inserted near the center comes out clean. Cool for 10 minutes before removing from pans to wire racks. There is a terrible lack of book club discussion ideas online. I’ve decided to post our monthly book club discussion sheet on my website. If other people do this, maybe I won’t have to come up with the questions all on my own anymore. Or I guess we could just read books that already have the discussion guide in the back. But then we’d be an Oprah Book Club. Each character’s voice attempts to offer insight into the meaning of life and death. Does any one character do this better than the others? Are older people necessarily smarter than younger people when it comes to the philosophy of living? Are the characters likable? Is it important that we like them in order to enjoy and/or understand the story? Which Character did you like or at least empathize with the most? The least? Why? Do the narrators always tell the truth? If not, do you think they are being dishonest on purpose? What does this story teach us about what defines friends and family? Do the characters become friends? Knowing what you know about the characters by the end of the story, do you think these characters had a reason to live at the beginning of the book? Do you think anything changed for them by the end? Do they have more or less of a reason to live by the end of the book? Knowing what you know about the characters by the end of the story, do you think they would have actually jumped if they had been alone on the roof New Year’s Eve? Did the first person round-robin narrative work for this story? Does Hornby’s use of pop culture references work? Did it make the story more interesting or accessible for you? Is it appropriate to use humor when writing about a serious and potentially upsetting subject like suicide? Did you find the book funny? If so, did laughing ever make you feel uncomfortable? garbage bars, originally uploaded by laurasjoquist. When I make something Jack likes he usually asks me if I came up with the recipe on my own. Not, did I make it from scratch, but did I create a whole new, never before made recipe from the depths of my genius kitchen mind. He’s demanding that way. 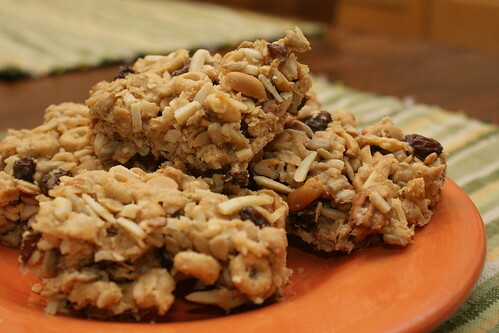 But I’m pleased to say that today I made my very own granola bar recipe and it is fabulous. Although to be honest it was less of a granola bar than just a bar bar this time around. Tossed in melted honey mixture then baked at 350 for about 20 minutes. classic peanut butter, originally uploaded by laurasjoquist. This is the second cookie recipe I made from the cookie book I received for Christmas. 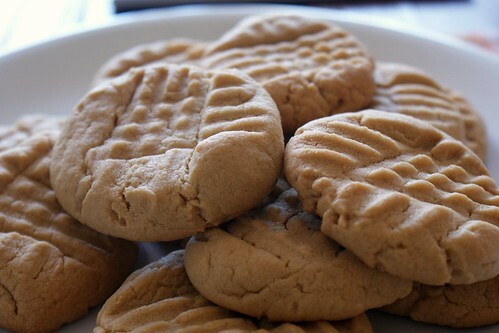 It’s the classic peanut butter cookie with fork marks. Always light and crispy and not too sweet. My boys aren’t much for the cookie eating so I guess I’ll have to give these babies away to get them out of the house. Jack has a sleep over tonight, sounds like a good way to get rid of them. I will be holding down a table at the Baker Street Cafe in Dixon IL this Saturday from 6-8 pm. Every month Dixon hosts Second Saturdays when artists and the like hang out at venues around town to talk about their work. So if anyone shows up and asks, I’ll be talking about what I paint and why. And let’s face it, I’m not bragging when I say my paintings have really great stories behind each and every one. Also, I managed to turn it into a date night with my spouse-so bonus. I made this elephant out of an Ambercrombie and Fitch sweater for a friend’s baby due this month. It’s her second and the gender is unknown this time. I tried to remain gender neutral, but I think he looks like a boy elephant. I named him A. Fitch.